Ankle arthritis that has failed conservative treatment warrants a more aggressive approach. Most treatments for ankle arthritis are primarily joint destructive, with a high probability for long term negative sequelae. The option to attempt surgical treatment with a less invasive procedure is appealing for both the surgeon and the patient. The purpose of this study is to demonstrate the efficacy of ankle arthrodiatasis with the use of external fixation as an alternative treatment for ankle arthritis. Eighty-two patients were evaluated preoperatively and postoperatively for pain, function, and complications with the Maryland foot score. Twenty patients (24%) experienced excellent results, forty-five (55%) good results, twelve patients (12%) had fair results, and five patients (6%) had poor results. Of the five poor results, four patients underwent an ankle replacement and one patient underwent ankle arthrodesis. The authors consider the use of ankle distraction with ankle arthroplasty as a viable alternative to previously accepted treatments for severe ankle arthritis. The hallmark benefit of this procedure is its joint sparing properties. Decreased soft tissue dissection associated with the use of external fixation makes this less invasive treatment available to a wide range of patients. Ankle arthrodiatasis is a viable treatment option for the treatment of advanced ankle arthritis. Articular damage to the ankle joint has a broad range of etiologic processes including traumatic arthritis, primary degenerative osteoarthritis, neuropathic arthropathy, inflammatory arthritis, and infectious arthritis. Because of pain when ambulating or inability to bear weight, these ankle arthritides can be exceedingly debilitating. The most common causes of degenerative changes in the ankle joint are previous trauma to the joint and abnormal ankle mechanics . Unlike the larger, more proximal joints of the lower extremity, primary idiopathic osteoarthritis is not the leading cause of damage to ankle joint articular cartilage. It has been previously shown that up to 70% of symptomatic ankle arthritis is associated with past rotational ankle fractures or other previous trauma, with only 7% manifesting as primary (idiopathic) osteoarthritis . Ankle arthritis may be evaluated both clinically and radiographically. On examination, patients may present with painful and limited joint motion, tenderness, variable degrees of inflammation, joint crepitus, and osseous deformity. Evidence of joint space narrowing, osteophyte formation, subchondral cystic lesions, and osseous erosions are often visible radiographically (Figs 1A and 1B). Early symptoms of ankle arthritis can be treated successfully with several conservative therapies. Pharmacologic agents, such as non-steroidal anti-inflammatory drugs (NSAIDs), intra-articular steroidal injections, and visco-supplementation with sodium hyaluronate injection may be beneficial in reducing symptoms . Lifestyle changes, which include weight reduction and the use of bracing devices such as Ankle-Foot Orthoses have shown to decrease symptoms as well. When conservative measures fail and symptoms persist a more aggressive approach is warranted, which includes operative intervention. 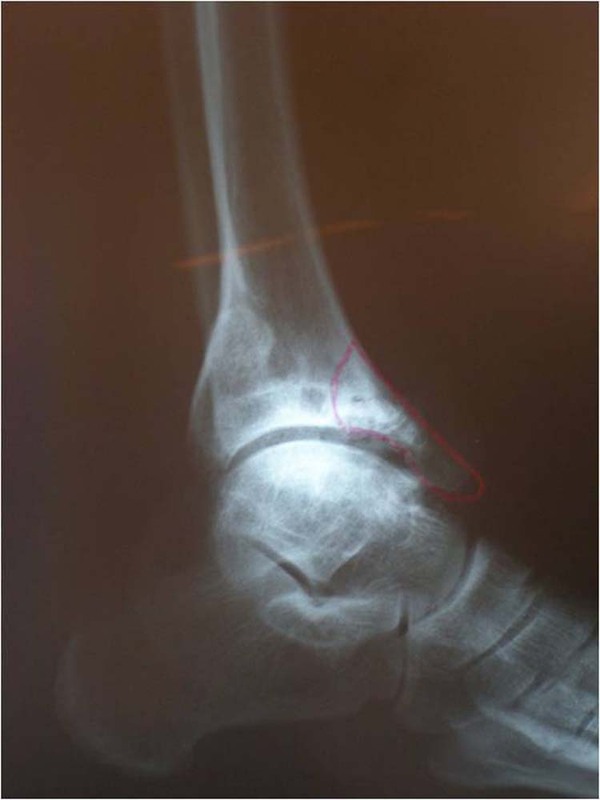 Figure 1A and 1B Preoperative anterior-posterior radiograph of arthritic ankle joint (A). Preoperative lateral radiograph of arthritic ankle joint showing extensive tibial hypertrophy (B). 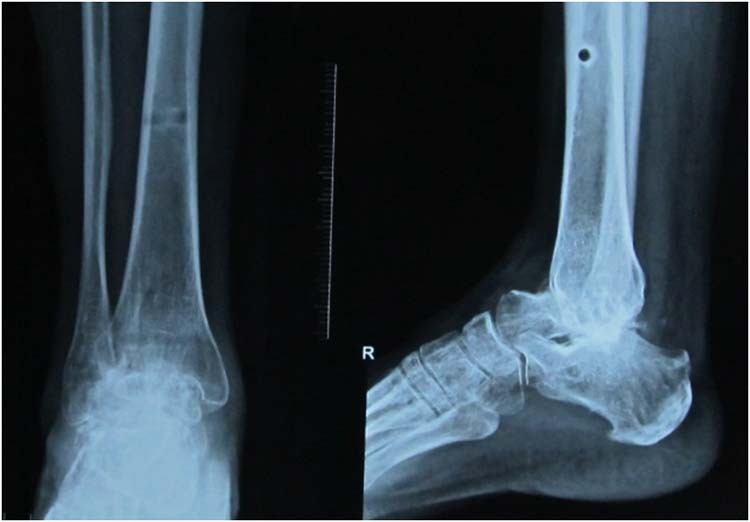 To date, ankle arthrodesis for the treatment of end-stage ankle arthritis has yielded good short- and intermediate-term results. Several reports [4,5,6] have suggested that primary arthrodesis relieves symptoms in approximately 80% of treated individuals by providing a stable, plantigrade, and ideally a painless foot. Yet even when performed appropriately, this procedure has its inherent complications, including malalignment, abnormal biomechanics, painful retained hardware, and most importantly premature arthritis of adjacent joints. With advances in joint replacement technology, new generation ankle prostheses are designed to more accurately mimic the true anatomy and biomechanics of the ankle. Unlike early counterparts, these second generation implants have exhibited promising results . Ankle joint replacement however, is a difficult procedure to master, and fraught with the possibility of long term complications and eventual implant failure. With a high technical learning curve, these procedures should only be performed by skilled surgeons with adequate procedural volume. Salvage procedures after failed ankle replacement may include revision, arthrodesis, and even amputation . The term “arthrodiatasis” was coined in 1979 in Verona, Italy. Its origin stems from the Greek words for “joint” (arthros), “through” (dia), and “to stretch out” (tasis) . In 1975, Volkov and Oganesian first reported the use of joint distraction in the knee and elbow . Only recently has literature started to surface which studies distraction for the treatment of arthritic ankles. The first documented case of ankle arthrodiatasis was published in 1978 [9,11], but the majority of work with ankle distraction began in the 1990’s. Van Valburg et al. reported on joint distraction utilizing an Ilizarov apparatus in 11 patients, resulting in increased joint space as well as decreased pain and improved mobility for a mean of two years. Van Roermund, van Valburg, and their team in the Netherlands have led much of the research on ankle distraction [12-18]. Ankle arthrodesis and implant arthroplasty are both joint destructive procedures with a high possibility for long term negative sequellae . Ankle arthrodiatasis with the use of an external fixator carries the primary benefit of being non-destructive to the ankle joint, which retains for the younger patient the possibility of later implant arthroplasty or arthrodesis. The purpose of this study is to demonstrate the efficacy of ankle arthrodiatasis with the use of external fixation as an alternative treatment for ankle arthritis. Eighty-two distractions were performed in 82 non-consecutive patients from 1998 to 2010, with a mean age of 49 years of age, and follow-up ranging from one to 12 years. Of these, 45 were male and 37 female. Thirty-seven (45%) of patients had a deformity correction (i.e. 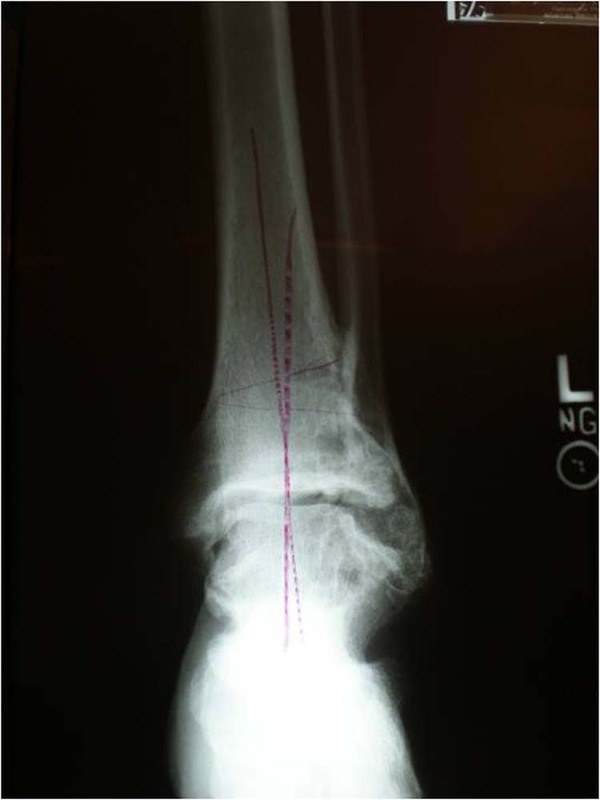 midfoot, calcaneal, or supramalleolar osteotomy) and twenty-three (28%) underwent an Achilles tendon lengthening. Seventy-Eight of 82 patients (95%) underwent an open ankle arthrotomy at the time of frame application to remove any impinging anterior osteophytes and improve ankle joint range of motion (Figs. 2A and 2B). 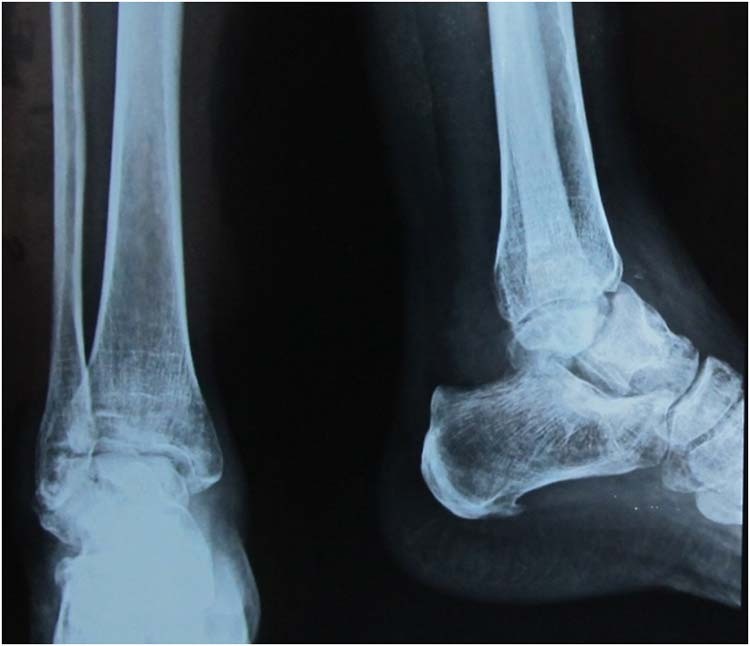 All patients had arthritis of the ankle joint secondary to trauma and were recommended for an arthrodesis by other treating physicians after failing conservative treatment. All patients had either slight or marked decrease in range of motion at the ankle as compared to accepted normal values with none of the ankles being graded as ankylosed. Figure 2A and 2B Open arthrotomy with visible osteophyte formation (A). Open arthrotomy following resection of anterior tibia (B). All patients were assessed by one of the two senior authors (ER or BH) both preoperatively and postoperatively using the Maryland foot score . Operative procedures were performed in the supine position under general anesthesia with a thigh tourniquet. If indicated, adjunctive procedures were performed at the time of frame application. 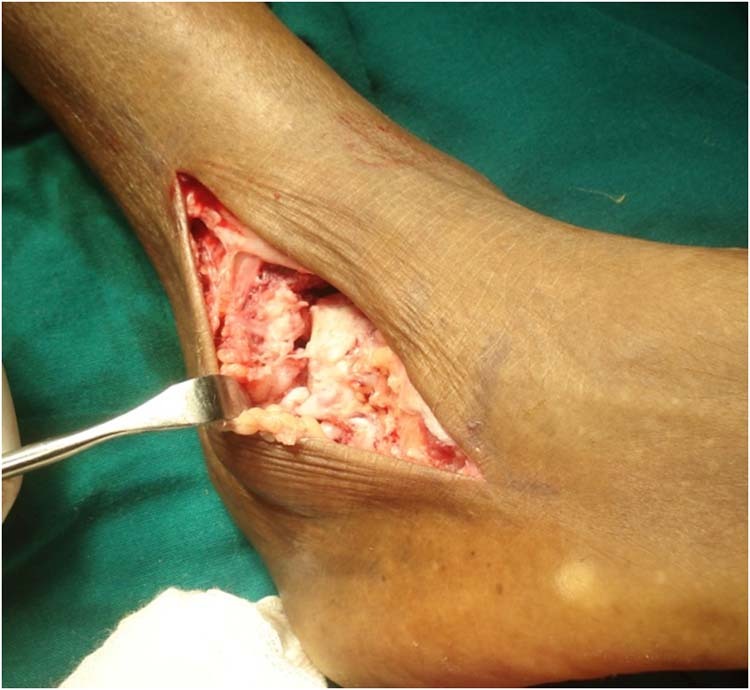 A percutaneous tendoAchilles lengthening was performed to correct ankle joint equinus. An osteotomy was performed in the calcaneus to correct for a varus deformity, or in the tibia to correct for a procurvatum deformity if indicated. 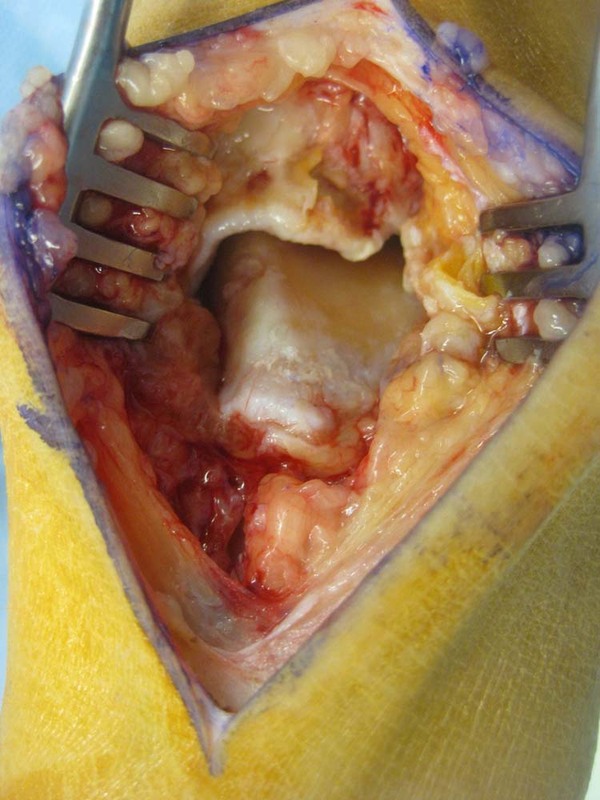 Aggressive ankle debridement at the time of ankle distraction was performed from either an open anterior medial approach or arthroscopically to increase intraoperative range of motion and remove osteophytic blocks and soft tissue impingement. An accessory anterior lateral incision was necessary as well in some cases. After performing the necessary ancillary procedures, incision sites were closed appropriately via the surgeon’s preference, and the pneumatic thigh tourniquet was deflated. 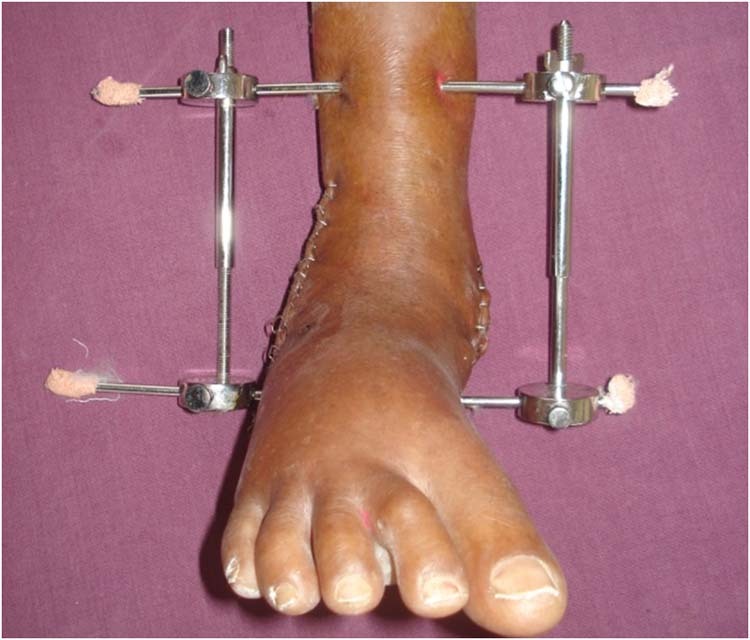 The authors utilized a multi-planar ring external fixation system for arthrodiatasis. 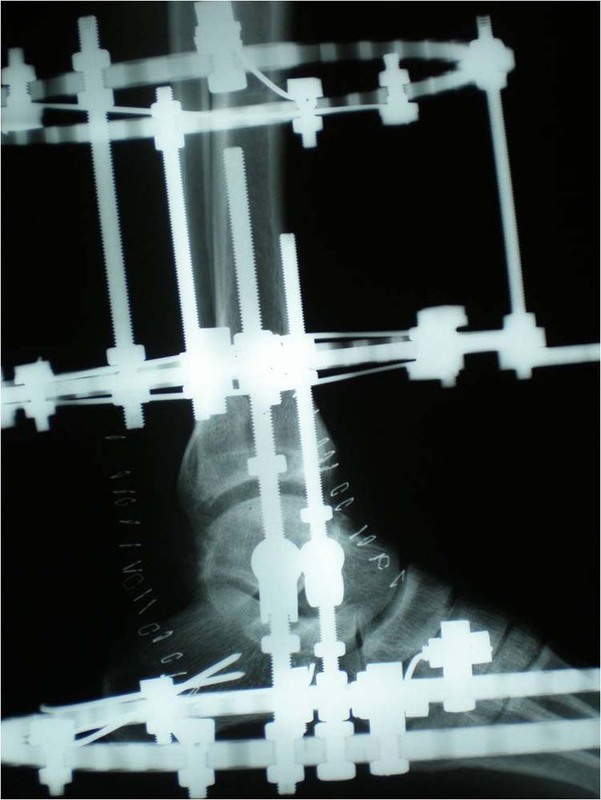 Three main objectives of frame design for ankle distraction are: providing stability, allowing sufficient room for soft tissue clearance, and permitting weight bearing as soon as possible. The frame was pre-built in order to minimize intraoperative anesthesia time. It was generally comprised of two proximal rings, which were attached to the tibia, and a distal foot plate or one-third ring, which was attached to the foot. The two tibial rings and the distal foot plate or one-third ring were separated by threaded rods, which varied in length depending on patient size. Three or four threaded rods separated each tier of the frame. Ring size was chosen to allow two finger-breadths between the ring and the leg at any point. Rings that are too large provide less rigid fixation, but it is essential that there is enough space to allow for postoperative swelling . The proximal ring was positioned perpendicular to the axis of the tibial shaft and the limb was centered within the ring. The ankle joint was placed at 90 degrees, with the foot in a neutral position. The distal one-third ring or foot plate was placed parallel to, but not distal to the plantar surface of the foot, so that patients were able to bear weight directly on the plantar foot with minimal interference from the distal frame. Smooth wires were utilized to attach the frame to the extremity, consisting of two crossing wires through the calcaneus distal to the neurovascular bundle, and two crossing wires at each tibial ring level. A third wire was placed at each tibial ring if the patient weighed more than 200 pounds. All wires were secured and tensioned to their corresponding ring. 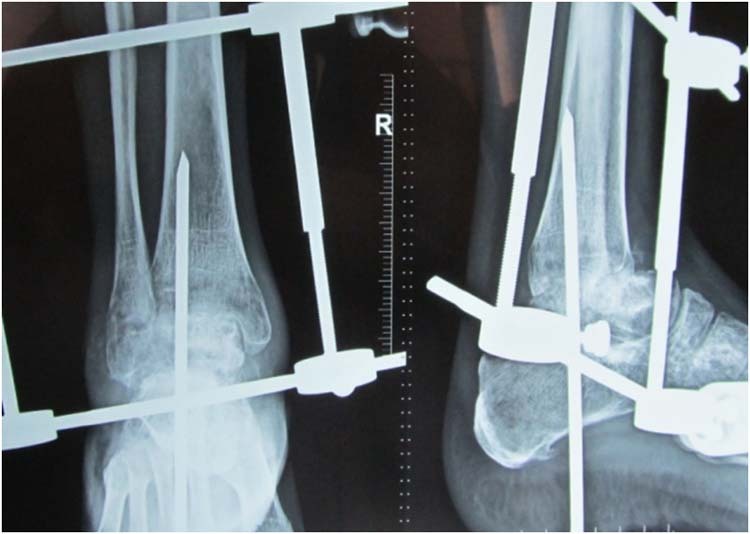 Distraction was accomplished by tightening nuts along threaded rods or with telescoping rods connecting the foot plate to the distal tibial ring for six millimeters of acute distraction. Fluoroscopic imaging was utilized to verify distraction length. Vascular supply and small vessel integrity were evaluated after distraction via palpation of pedal pulses and capillary refill time. In postoperative recovery if the patient was unable to tolerate the distraction, the amount of distraction was reduced until the patient was comfortable. Gradual distraction was accomplished at a rate of one millimeter per day in four separate daily adjustments until the desired amount of distraction was obtained. The space between the skin and the fixator rings was packed with a bulky bolster dressing in an effort to control postoperative edema. This is particularly important in the ankle and heel region where swelling is most severe after this type of procedure. Postoperative dressings remained in place for three to seven days. Distraction was confirmed radiographically at the first postoperative visit. (Figs. 3A and 3B) At time of dressing change, pin sites were cleansed with isopropyl alcohol. After approximately two weeks postoperatively, patients began daily self-care of the pin sites with the use of isopropyl alcohol. Sutures and staples remained intact until the frame was removed. Patients were allowed to begin wetting the frame in the shower after approximately two weeks, when the pin sites were dry and stable. Figure 3A and 3B Postoperative anterior-posterior radiograph depicting arthrodiatasis (A). Postoperative lateral radiograph depicting arthrodiatasis (B). Patients began partial weightbearing as soon as possible after the procedure. Under most circumstances, the patients were encouraged to begin touchdown weight bearing on the first postoperative day as tolerated. Physical therapy was started while patients were in the hospital to instruct the patient with gait utilizing an assistive device, usually a walker. The ring fixator was removed under general anesthesia after 10 to 12 weeks if a corresponding osteotomy had been performed, and after approximately six weeks if no osteotomy was performed. In most cases, the ankle joint was arthroscopically debrided, and lateral ligamentous laxity of the joint was assessed and repaired if necessary. Radiographs were taken at the time of frame removal (Fig. 4). 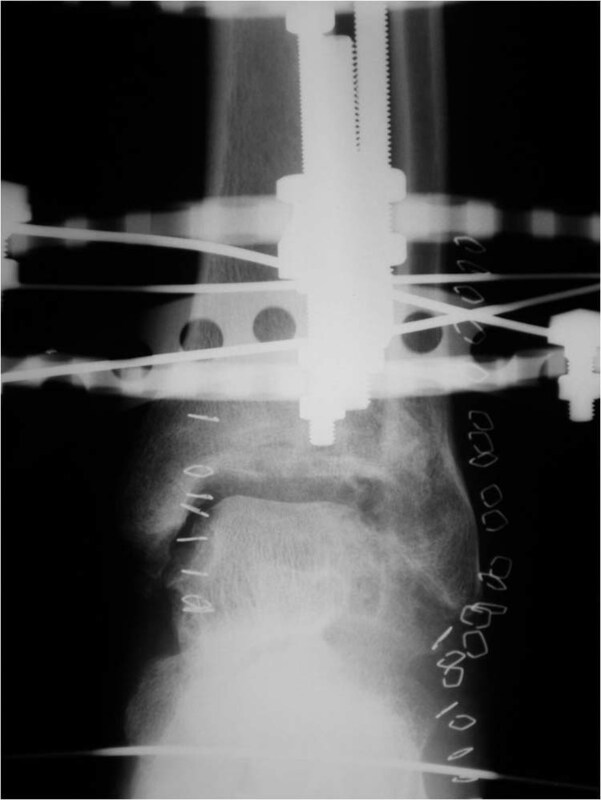 The patients began weight bearing immediately after the frame was removed with a fracture walker. Patients were able to bear full weight with the use of the fracture walker, but often required a gait assistive device such as a cane or crutch for a period ranging from several weeks to about two months after the frame was removed. Transition to regular shoe gear occurred at two to four weeks, depending upon whether or not ligamentous repair was necessary. Figure 4 Same patient as in Figure 1, following arthrodiatasis and frame removal. Patients were evaluated preoperatively for pain and function, and at most recent follow-up for pain, functional outcome, and complications. A retrospective chart review was performed, and patients were assigned to outcomes groups of excellent, good, fair, or poor based on the modified Maryland foot score. All patients rated their cosmetic results as acceptable postoperatively. Twenty patients (24%) had an excellent outcome. These patients reported minimal pain and were able to walk unlimited distances. These patients did not experience weakness, and did not require a supportive device. They related the ability to ambulate in any shoes, or shoes with only mild concessions. They also related the ability to ambulate on any terrain and climb stairs normally without difficulty. The 45 patients (55%) with good results experienced mild to moderate pain and were only slightly limited in walking distance. They experienced mild weakness not requiring a supportive device. They related the ability to ambulate in shoes with minor concessions or with orthotics. These patients experienced difficulty ambulating on rocks and hills. Several also reported requiring a banister or other method of assistance when climbing stairs. Twelve patients (15%) had fair results, and usually related moderate pain and were slightly to moderately limited in walking distance. They typically experienced mild to moderate weakness with only one patient requiring a supportive device. They were able to ambulate in shoes with orthotics, experienced difficulty ambulating on rocks and hills, and reported requiring some method of assistance when climbing stairs. Finally, five of the patients (6%) had a poor outcome following distraction. Four of these patients ultimately required an ankle replacement and one required ankle arthrodesis. The most common complication encountered was pin site irritation or infection in 12 patients (15%), which is commonly seen with external fixation. Clinical signs of local infection were treated successfully with use of aggressive cleansing of pin sites and with oral antibiotics if necessary. 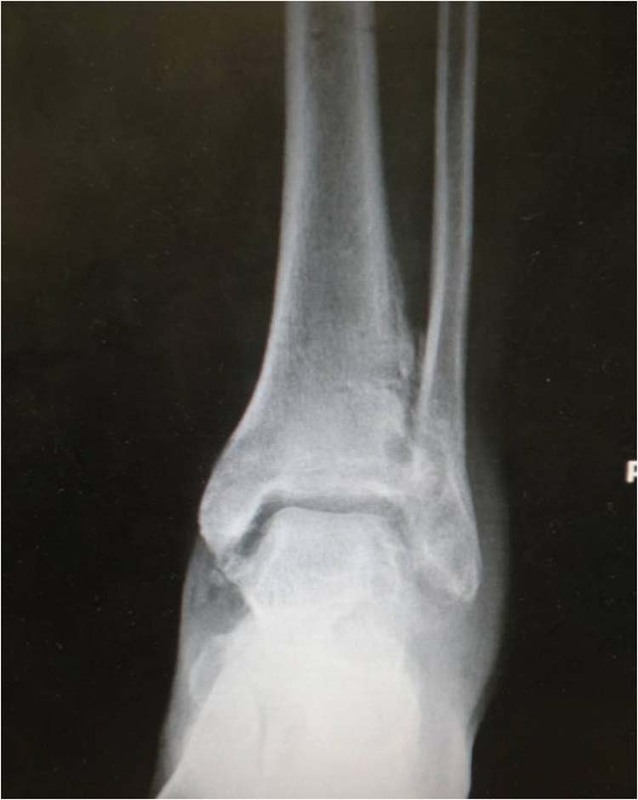 One patient (1.2%) developed acute osteomyelitis which was resolved with intravenous antibiotics. One patient (1.2%) was removed from the multiplanar ring fixator in four weeks secondary to psychological intolerance to the device. Ligamentous laxity after distraction occurred with two patients (2.4%), and was corrected with either bracing or lateral ligament repair. One patient (1.2%) developed a deep vein thrombosis, leading to a pulmonary embolism. This was treated and completely resolved via anticoagulant therapy. 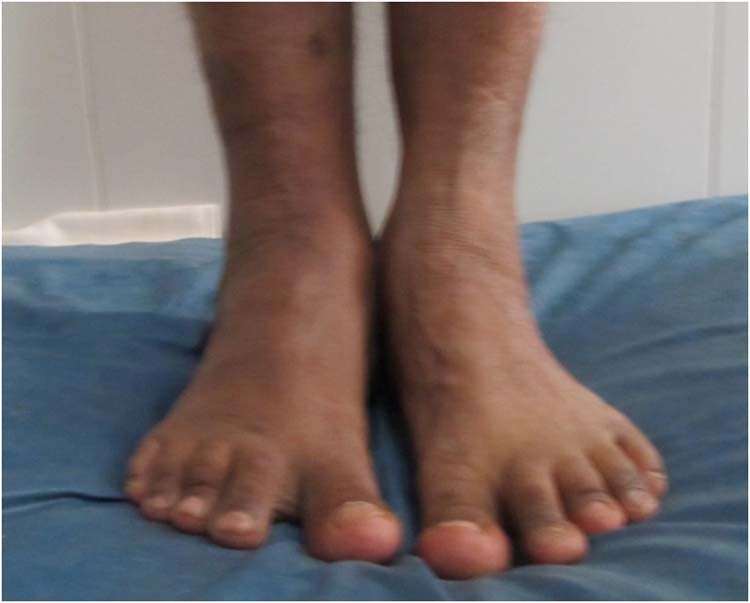 One patient (1.2%) developed Charcot neuroarthropathy of the midfoot. Fortunately, this development was identified and treated promptly, and did not change the patient’s overall functional outcome. Advanced arthritis of the ankle joint can be one of the most difficult and debilitating pathologies treated by the foot and ankle specialist. Although no single treatment is appropriate for every patient, the authors consider the use of ankle distraction with arthroplasty as a viable alternative to previously accepted treatments. Decreased soft tissue dissection associated with the use of the external fixation device as compared to more aggressive procedures make this treatment available to a wide range of patients. It has been advocated  for patients under the age of 50, to delay arthrodesis procedures by five to ten years and opt for other operative procedures. Stress placed on adjacent joints following ankle arthrodesis often leads to arthritic changes in these joints as well. It follows therefore that arthrodesis of the ankle joint should be avoided in younger patients. The non-destructive nature of arthrodiatasis creates an additional option to delay arthrodesis provided the patients are proper candidates for the procedure and understand the possible need for a more aggressive procedure later on in life. Few studies have been published on the use of ankle distraction as treatment for severe ankle arthritis. In 1995, van Valburg et al. reported on joint distraction utilizing an Ilizarov apparatus in 11 patients with posttraumatic arthritis. Improvement in pain and mobility were noted. Ankle range of motion increased by 55% and joint space widening was seen in 50% of the patients radiographically. Van Valburg, et al,. published a two year prospective follow up in 17 patients, indicating that 66% continued to have symptomatic relief. In 1998, van Roermund, et al,. presented three cases of joint distraction for arthritis. The joints distracted in this case study were the interphalangeal joint of the thumb, the patellofemoral joint, and the ankle joint. Van Roermund et al. later implied that joint distraction in the case of severe ankle osteoarthritis may be a treatment of choice. In 2002, Marijnissen, et al,. reported significantly better results with ankle distraction than with debridement alone. Marijnissen, et al,. then advocated the use of ankle joint distraction as the treatment of choice in patients of a relatively young age with severe ankle arthritis. In a study reporting the effects of joint distraction in a canine model, van Valburg reported that in the arthritic canine knee joint distraction produced a return to control levels of abnormal cartilage proteoglycan as well as a decrease in local inflammation, suggesting a change in cartilage metabolism . Chiodo and McGarvey advocated further study of ankle distraction due to its minimally invasive nature, combined with the fact that it is not joint-destructive . Even if joint distraction provides only temporary relief and clinical results slowly deteriorate over time, more definitive and committed procedures can potentially be postponed for a considerable period of time. Ploegmakers, et al,. reported six of 22 patients (73%) treated with ankle distraction showed significant improvement in symptoms at seven years postoperatively . Most recently, Paley and Lamm have performed 20 ankle joint distractions using a hinged external fixator, allowing for range of motion within the ankle joint . Eighteen of the distracted joints were rated good or excellent, with a follow up ranging from two to 17 years. In theory, distraction of the ankle joint allows for maintenance of intermittent intra-articular fluid pressure, thereby promoting cartilage reparative processes . Damage to the ankle joint is further diminished by offloading contact between the joint surfaces. Subchondral sclerosis is reduced during distraction, which decreases the mechanical stresses on the cartilage during loading of the joint and allows for greater absorption of stresses during ambulation [9,13,14,23]. As noted previously, there is a much lower incidence of primary osteoarthritis in the ankle compared to the knee. Studies performed by Cole, et al,. compared the cartilage between the human talocrural and tibiofemoral joint. They were able to demonstrate that the ankle joint had better reparative processes compared to the knee joint. The biochemical composition of the ankle joint has a more dense extracellular matrix, which resists loading and is less prone to damage [25,26,27]. This may cause a shift in the distracted joint, favoring cartilage synthesis rather than degradation. The ability of ankle cartilage to repair itself along with the documented clinical benefits of ankle distraction has caused increased interest in this particular joint sparing operative procedure. As is the case with almost all operative procedures, proper patient selection is a key component to increasing the chance for a successful outcome. Radiographic criteria, concurrent lower extremity deformities, the age and overall health of the patient, and the patient’s motivation and willingness to comply with instructions are all key factors to consider when deciding whether ankle distraction is appropriate for a patient. Before considering patients for ankle distraction, the surgeon must evaluate and address any adjacent lower extremity deformities. Additional procedures may be indicated to create a stable, plantigrade foot, which is necessary for a successful outcome after ankle distraction. The surgeon must also be prepared to address any talar dome lesions that may be present, either arthroscopically or with open arthrotomy. Standard weight bearing radiographs of the foot and ankle provide sufficient preoperative imaging for most distraction procedures. Hindfoot alignment views or other imaging modalities may be necessary to evaluate more complex deformities. Common findings among post-traumatic arthritic joints, which are most prevalent with ankle arthritis, include joint space narrowing, subchondral sclerosis, osseous erosions, and osteophyte formation. Relative radiographic contraindications to performing an ankle distraction include flattening of the talar dome, presence of greater than five degrees of valgus or varus deformity of the hindfoot, midtarsal joint degenerative joint disease, severe forefoot abnormalities, and severe equinus deformity. Generally, ankle arthrodiatasis is indicated for younger or more active patients experiencing pain, instability, and deformity but seeking alternatives to ankle arthrodesis and replacement. Patient age is less important than the individual’s overall health, compliance, motivation, and ability to tolerate rigorous post-distraction rehabilitation and physical therapy. Distraction procedures have been shown to produce slow, progressive improvement over a period of many months with most patients noticing the greatest amount of functional and symptomatic improvement approximately one year after surgery . Contraindications to performing this procedure include medical co-morbidities that preclude the patient from undergoing an elective operative procedure, severe osteoporosis, infection, non- reconstructable malalignment of the lower extremity, severe peripheral vascular disease and neuroarthropathy. Psychosocial issues must also be addressed prior to frame placement. The most common complication associated with external fixation procedures is pin-tract infections . Fortunately, these infections are usually superficial and localized, making them manageable to treat. The infections often begin as a cellulitis secondary to Staphylococcus aureus, and they respond quickly to oral antibiotics . If the infection involves deeper tissues and/or bone, the patient may require intravenous antibiotic therapy, with or without wire removal . Pin-site care opinions differ, but a study by Davies, et al., showed that pin-sites and wires managed with the technique used by the Russian Ilizarov Scientific Centre for Restorative Traumatology and Orthopaedics were less likely to develop pin tract infections . This technique focuses on avoiding thermal injury and local formation of hematoma during surgery and utilizing alcoholic antiseptic and occlusive pressure dressings postoperatively. Neurovascular injury during pin placement can generally be avoided with proper planning and a firm grasp of the cross sectional anatomy in each region of wire placement. Posterior tibial nerve traction injuries and tarsal tunnel syndrome are also possible complications associated with ankle distraction procedures . Gradual distraction of the ankle can sometimes prevent this complication. Another option for prevention is to perform a prophylactic tarsal tunnel release at the time of ankle distraction. The posterior tibial nerve is at risk for traction injuries during acute or gradual correction of hindfoot deformities. The addition of this procedure has been shown to relieve a considerable amount of postoperative nerve traction and tarsal tunnel symptoms [31,32]. Venous thrombosis is always a risk after procedures in which external fixators are applied, and the surgeon should use prophylactic measures to prevent this. Low molecular weight heparin (LMWH) is started approximately 12 to 24 hours after surgery and continued for 28 to 42 days following the procedure, depending upon the patient’s other risk factors. LMWH is advantageous in that it can be given at a constant dose without any laboratory monitoring. Randomized clinical trials comparing LMWH with unfractionated heparin in general surgical patients have found that LMWH given once or twice daily are as effective or more effective in preventing thrombosis [33,34]. Warfarin has also been compared with LMWH, and most studies show a superior benefit with LMWH [35,36]. The patient should be encouraged to start moving the lower extremities as soon as possible postoperatively. Intermittent sequential compression devices (SCDs) for prophylaxis against deep vein thrombosis (DVT) on the contralateral limb is important while the patient is still in the hospital. Hardware failure in the form of wire breakage will occasionally occur, more frequently with the wires in the foot. This is usually because of excessive strain in the foot during walking with a fixed ankle . If this occurs, the wire can be removed and replaced with a new wire if necessary. It is important to check and adjust tension of all wires at postoperative visits. For patients over 200 pounds, it is recommended to place three wires across the tibia at each level of the tibial rings. This will aide in prevention of hardware failure. It is important to check for ligamentous laxity and instability immediately after the frame is removed intra-operatively. If ligament damage is present, repair of the lateral ankle ligaments is often necessary. If the patient is complaining of symptoms related to this condition postoperatively when the frame is removed, these symptoms can usually be managed successfully with physical therapy and functional bracing. Failure of the ankle distraction procedure to relieve pain is always a possibility. Ankle arthrodiatasis is generally performed on patients who have advanced, debilitating arthritis, and the patient must go into the procedure with the understanding that an arthrodesis or an implant may be necessary in the future. After ankle distraction there is often a period of increased pain and stiffness for two to four months, and it can take as long as six to twelve months to see improvement. During this time, the patient should continue with aggressive physical therapy and non-impact activities . Radiographic improvements are sometimes seen for as long as five years after arthrodiatasis, indicating that ankle distraction benefits are progressive in nature . It is the author’s belief that the benefit of ankle arthrodiastasis outweighs the mild and infrequent nature of the complications encountered with this procedure. Ankle distraction with ankle arthroplasty should be considered a viable treatment for severe ankle arthritis for its minimal dissection and joint-sparing properties. Future treatment for ankle arthritis will likely involve ankle distraction in conjunction with newer methods in cartilage repair, such as autologous chondrocyte transplantation, autologous osteochondral transfer, and allografts. With new advances and developments, further studies will be required to study the efficacy of these procedures. 12. Marijnissen AC, van Roermund PM, van Melkebeek J, Lafeber FP. Clinical benefit of joint distraction in the treatment of ankle osteoarthritis. Foot Ankle Clin 2003 8: 335-346. 13. Marijnissen AC, van Roermund PM, van Melkebeek J, Schenk W, Verbout AJ, Bijlsma JW, Lafeber FP. Clinical benefit of joint distraction in the treatment of severe osteoarthritis of the ankle: proof of concept in an open prospective study and in a randomized controlled study. Arthritis Rheum 2002 46: 2893-902. 21. Paley D. The principles of deformity correction by the Ilizarov technique: technical Aspects. Tech Orthop 1989 4:15-29. 22. Mann R. Arthrodesis of the foot and ankle. In Surgery of the Foot and Ankle. Editors: Mann R, Coughlin M, St Louis, 1999, Mosby, 651-698. 31. Beaman DN, Gellman RE, Trepman E. Deformity correction and distraction arthroplasty for ankle arthritis. Tech Foot Ankle Surg 2006 5:134-143. 2Director: Franciscan Foot & Ankle Institute; 34509 9th Ave S., Ste 306, Federal Way, WA 98003. 3Federal Way Orthopedic Associates, Federal Way, WA 98003. 4St. Cloud Orthopedics, St. Cloud, Minnesota.